Directions: These questions pretain to limiting the domains of linear equations to match conditions. At age 10, Zak puts $5 in a piggy bank and adds $5 every year there after. At age 40, he will break the piggy bank and spend his savings. 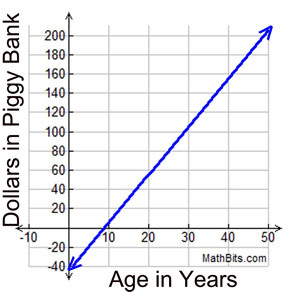 The amount of money in the piggy bank can be modeled by the equation d = 5a - 45, where d is dollars in the piggy bank and a is Zak's age. Which constraint applies to the model of this story? A child slides down a slide starting 12 feet above the ground. 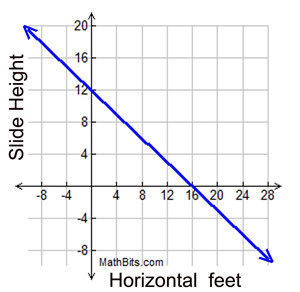 The child's path is modeled by the equation s = -0.75h + 12. where s is the height on the slide in feet and h is the horizontal distance on the slide in feet. The slide ends one and one-half feet above the ground. Which constraint applies to the model of the path down the slide? A cross country skier starts out on a 5 mile trail. The trail from mile 1 to mile 3 is a flat open field which is 2 feet above sea level. 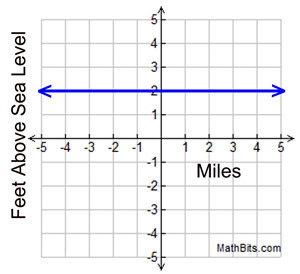 This portion of the trail can be modeled by the equation y = 2 where y = feet above sea level and x = miles traveled. Which constraint applies to the graph of this portion of the trail? The Ellen Brook School District closes school if the morning temperature is at, or below, -20º F. The superintendent follows the temperature starting at 2 am and makes the decision whether to close the school at 6 am. 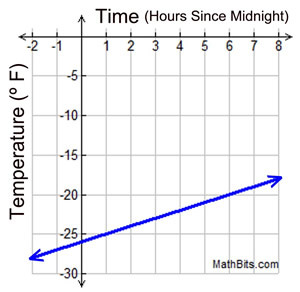 The early morning temperatures during one such cold spell followed the model y = x - 26. where y = the temperature (º F) and x = hours since midnight. Which constraint applies to the graph of this decision-making process?